And another non-guacamole plant-thing that he’ll eat? Corn on the cob. He rated this Grilled Corn on the Cob with Basil-Parmesan Butter as “probably the best corn I’ve ever had.” I’d probably agree, too. The flavorful compound butter was a perfect match with the grilled corn. These babies will be making a regular appearance on our menu this summer. 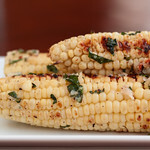 Sweet, smokey corn slathered with a garlicky, basil compound butter. Shuck the corn, leaving a couple of layers on the corn. Soak the corn in a sink of cool water while heating the grill to high. Combine the remaining ingredients in a small bowl, mixing thoroughly. Grill corn until the outer husks have mostly charred, about 20 minutes, rotating occasionally for even cooking. Remove from heat and let cool enough to handle. Remove remaining husks and slather with the butter. The Weber cookbook is my husband’s favorite! We always make this recipe in the summer time. It is our favorite way to make corn! Jamie has inspired me SO much! I love that show especially because he doesn’t necessary focus on everything being radically healthy, just good wholesome food. Like this corn. Good wholesome delicious. That looks so good! 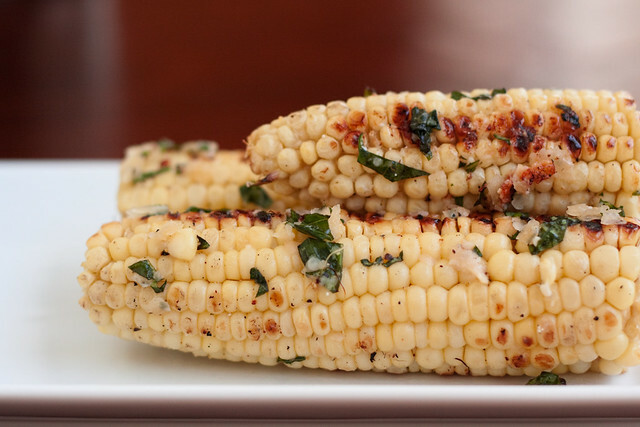 There is nothing better than fresh corn and it is even better when grilled. I love love corn on the cob, I can’t wait til it’s in season. I am going to try this recipe forsure. we LOOOOOVE grilled corn! never thought of adding seasoned butter, will have to try this!! thanks for sharing! I haven’t seen Jamie Oliver’s show, but definitely need to. Very crazy the things that some people eat (or don’t eat). Love the corn! Oooh, I love grilled corn! I like to mix melted butter with Asian chile-garlic paste and brush it on the corn. The basil sounds really good! That corn looks amazing! Wow. Yum! My mouth is literally watering right now over this corn. What a fun twist to the summer staple!